Update January 20, 2017: Ubisoft are partnering with Twitch for For Honor’s launch and beta, hosting stream events and giving away in-game goodies for launch. There’s the faction war we mentioned in the original post below, in which select Twitch streamers will be chosen to represent a faction. Global leaderboards will track the war’s status, and prizes will be given to people in the winning faction. These prizes will be redeemable in the full game. Keep an eye on our upcoming PC games list for more games from the future. 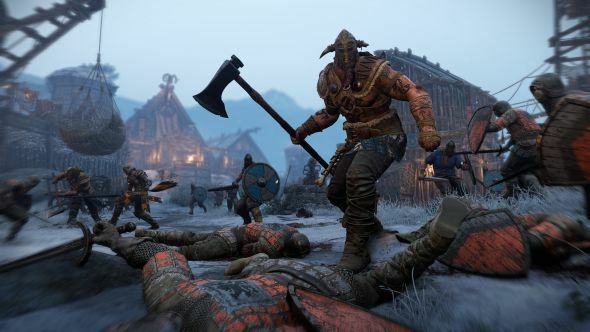 Once For Honor launches, another crop of rewards will be delivered to Twitch Prime members starting February 14, including a 10-day Champion Status – which comes adds sharable XP boosts, along with more XP from crafting – more loot at the end of each match, and a special emblem for you warrior. The full details are on the Twitch blog. For Honor has now gone gold, so there won’t be any delays, and I wouldn’t expect many changes between beta and release. Original Story January 10, 2017: Get ready to clash steel in a samurai, knights and Vikings three-way, as there’s a For Honor closed beta coming on January 26. If you want to participate in the beta, you’ll need to head to the For Honor site and sign up for battle. While the multiplayer test is going on, Ubisoft will be tracking the action with War of the Factions. Rewards will be doled out to the dominating factions and will transfer to the full game when it releases on February 14. The single-player won’t be available during the closed beta, but the full game will feature a proper campaign, as well as multiplayer action. For Honor’s multiplayer beta runs from January 26-29. If you want more on Ubisoft’s big melee battler, check out our For Honor newsfeed.